If you’re like me, then you probably don’t like things on your head. But if you’re also like me, you play a lot of multiplayer games online, and you’ve come to accept the fact that, in this instance, you’re going to have to deal with a thing being on your head for extended periods of time. Gaming headsets are awesome, because they allow us to connect with our friends online, and immerse ourselves in a gaming experience without waking up our neighbors with our sounds system. Sadly, they can also feel like they’re trying to crush our skulls, which has largely been my experience with gaming headsets, and that’s why I was so surprised by how comfortable the HyperX Cloud Stinger felt when I first wore it. I’ve spent a lot of money on expensive headsets that aim to provide comfort, and so, when I first opened the box of the HyperX Cloud Stinger to find a light, mostly cheap-feeling headset, I was instantly worried. Luckily, this headset is more cloud than stinger, as wearing it feels like you’re wearing nothing at all. The plastic rim is light, and the headphones are wide, and soft, leaving plenty of room for your ears. Insides of the headphones are also padded memory foam that doesn’t make you want to sweat all over the place, like I’ve experienced with headsets that include leather, for example.This is the first headset that I’ve ever worn that truly does not constantly remind me that I’m wearing a headset. The pitch of the HyperX Cloud Stinger is that it’s a far most cost-effective headset solution than most of the other options out there. At a $50 pricetag, I wasn’t expecting much from this headset. It’s made of plastic, mostly, and doesn’t have any shiny lights, or cool looking buttons on it — in fact, it only has one slider to increase or decrease the volume. It isn’t wireless, and it won’t sync to your phone with bluetooth. But looks can be deceiving, as the sound quality is much better than you might imagine. The HyperX Cloud Stinger isn’t the best-sounding headset in the world, but it provides clear audio, and a static-free experience that I have experienced in the past with more expensive headsets. Does this headset have a racing mode, a horror mode, and an action mode? No. Does it provide basic, reliable quality of sound for gamers who don’t want to mess around with ten different sounds modes? Absolutely. The only issue that I experienced in my time with the HyperX Cloud Stinger, is that it occasionally disconnects, which is admittedly a huge issue. Sometimes the sound will just cut out altogether, and you’re forced to unplug, and reconnect the headset, restoring the sound. This only happened a handful of times, but is obviously a fairly large annoyance when it happens. The mic, on the other hand, has zero issues. I played online for hours with friends while utilizing voice chat, and received no complaints. The HyperX Cloud Stinger is compatible with just about every device. It comes boxed with an adapter for PC users, and easily plugs into both the PS4, and the Xbox One. The quality and functionality across all devices is consistent, although when used on the PS4 there is no way to easily do things like control chat/in-game audio levels, due to the lack of buttons on the headset itself. The Xbox One’s functionality fares better, as the headset plugs right into the standard adapter that most Xbox users have, but those who don’t have such an adapter won’t have access to those features as the headset doesn’t come boxed with one (as many headsets do). 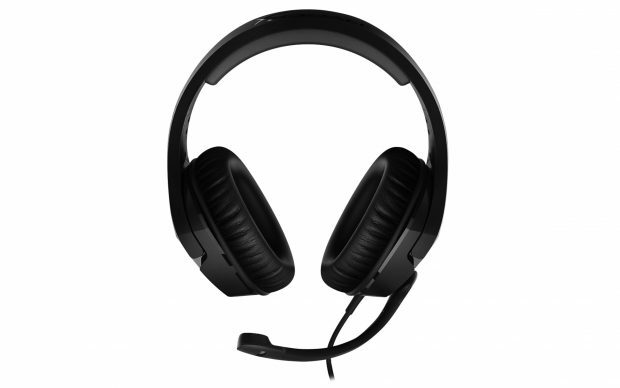 The HyperX Cloud Stinger is an excellent option for those looking for a quality headset on a limited budget. The one I received suffered from some occasional connection issues, and it lacks features that many headsets possess, The HyperX Cloud Stingersets itself apart by providing a quality sound experience, while being extremely comfortable without breaking the bank.